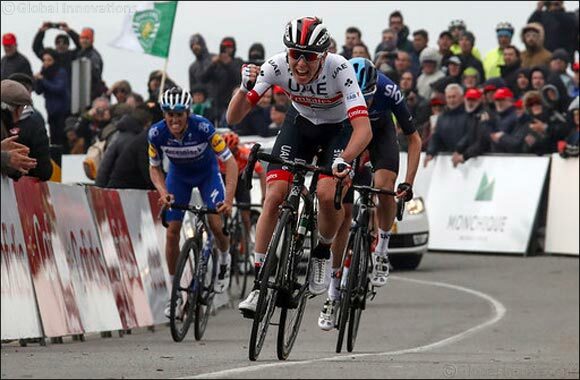 UAE Team Emirates’ Tadej Pogacar has wasted no time in putting his stamp on the UCI World Tour after picking up the team’s sixth stage victory of the season – this time at the Volta ao Algarve. The 20-year-old battled hard on the 7.8km summit finish, seeing off competition from Enric Mas, Wout Poels and his Team Sky teammates who set a ferocious pace going into the final climb. But it was a great day for the Slovenian, who didn’t fade under the attacks from his rivals and responded with a powerful surge at 300 metres out that allowed him to secure his first ever professional win. The victory propelled the youngster to the top of the General Classification (GC) standings, and will undoubtedly provide a boost for his team mates currently in the UAE, set to compete at the inaugural UAE Tour beginning this Sunday.